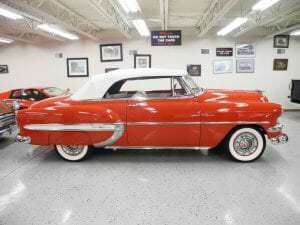 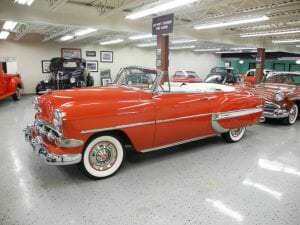 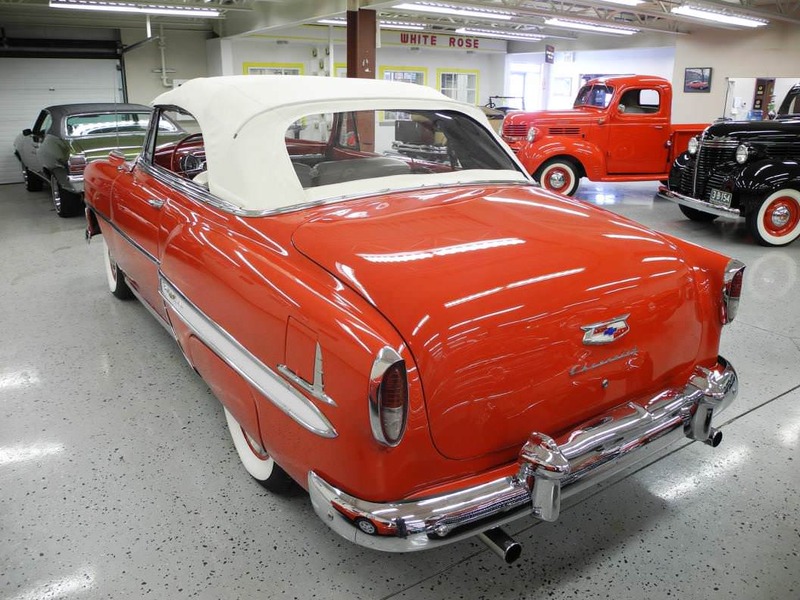 Chevrolet renamed its series of autos in 1953 to Bel Air, the name was applied to the premium priced model, while two lower priced series were 150 and 210. 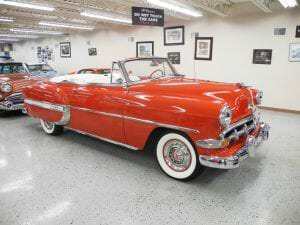 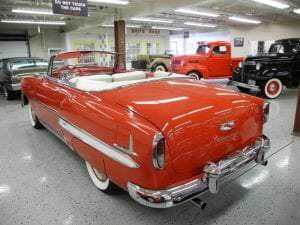 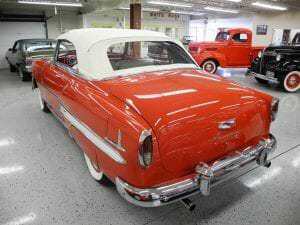 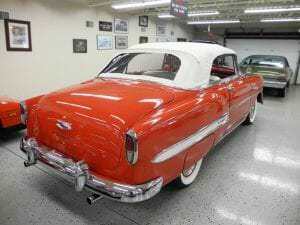 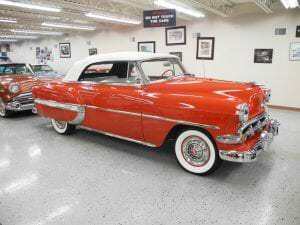 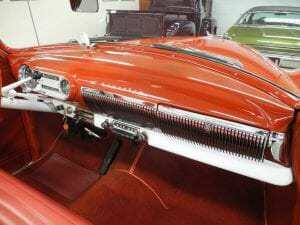 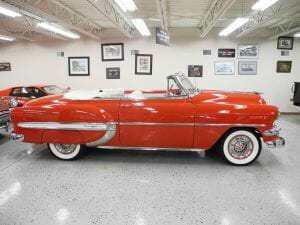 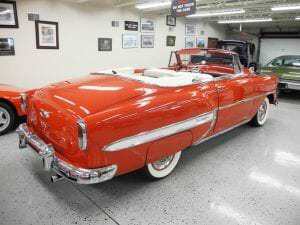 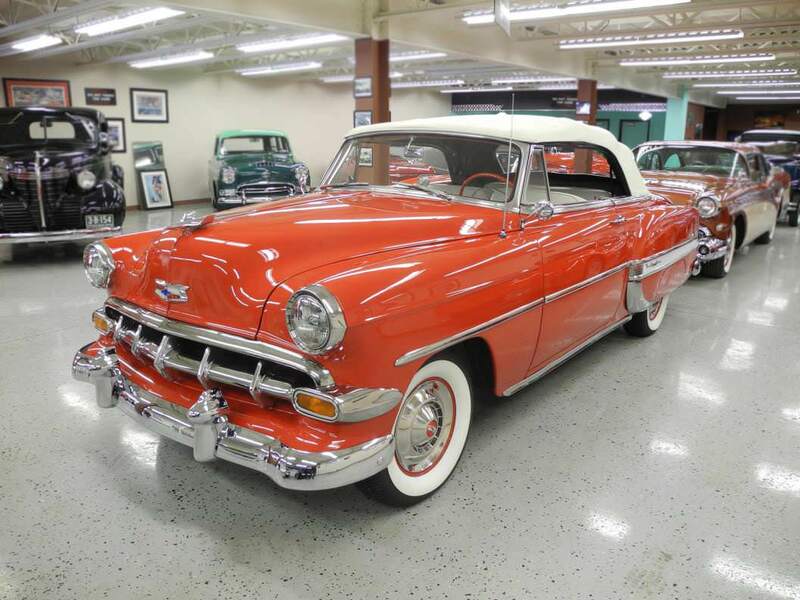 All Bel Air’s featured a wide chrome strip of molding from the rear fender bulge to the rear bumper, lesser models had no designation anywhere on the car, only having a Chevrolet crest on the hood and trunk, it was also the first year for a curved, one-piece windshield. 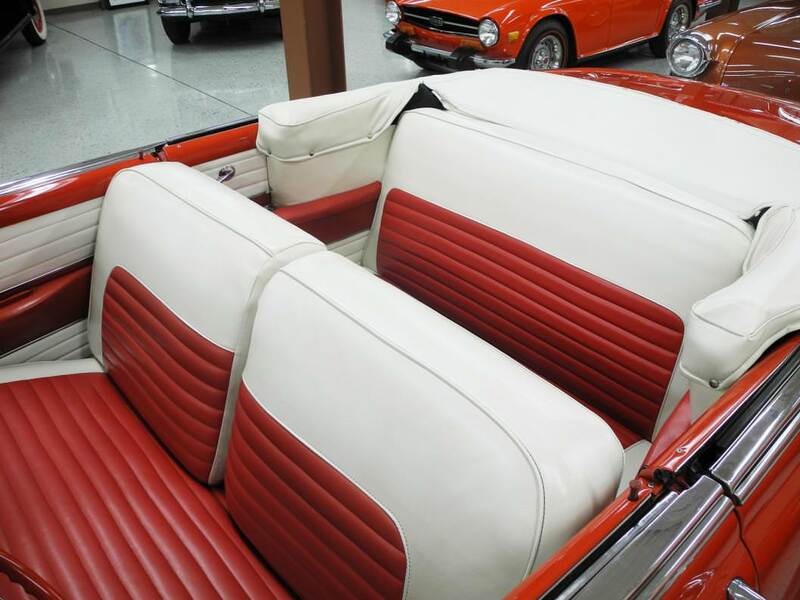 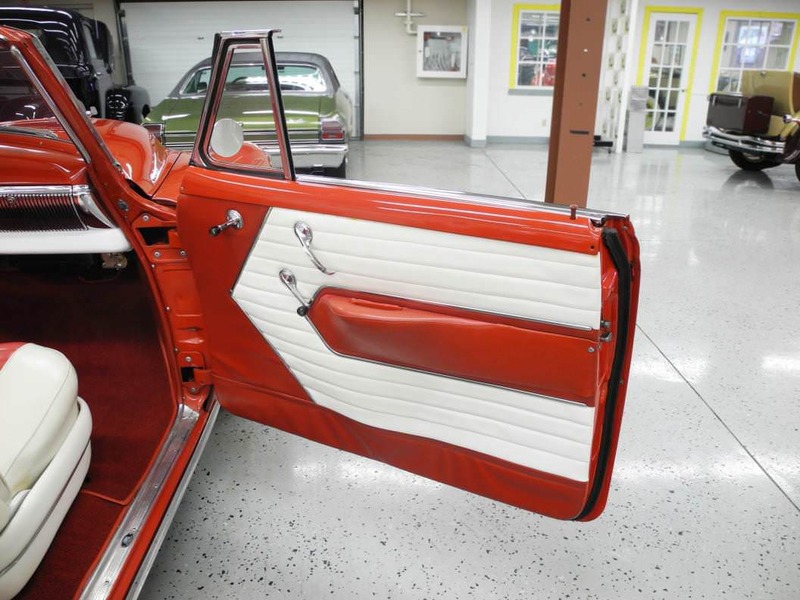 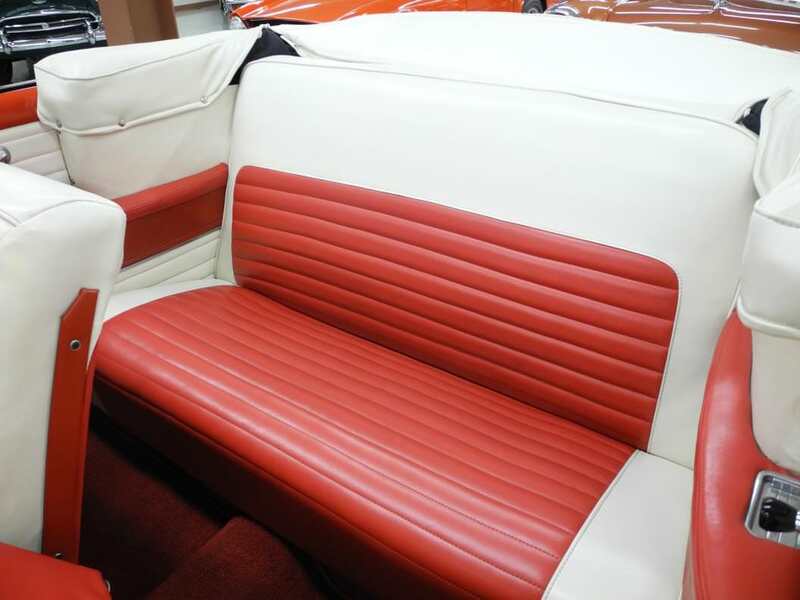 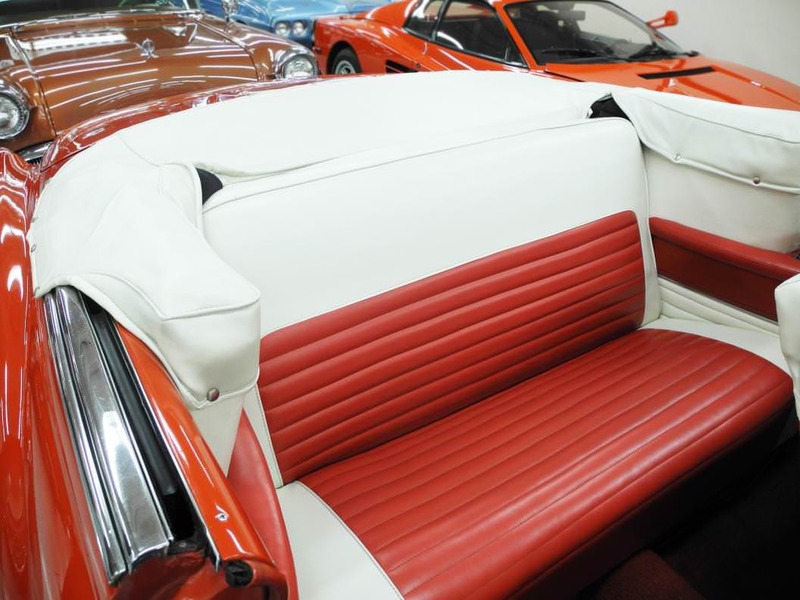 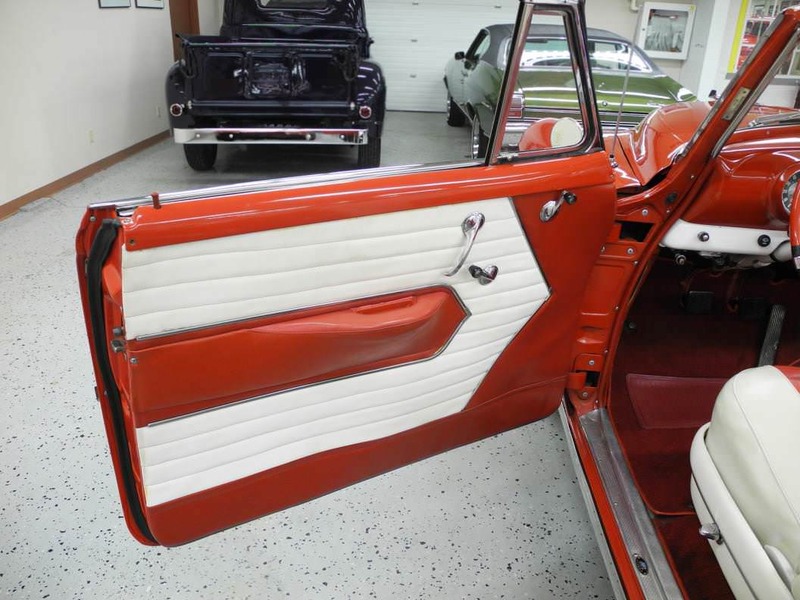 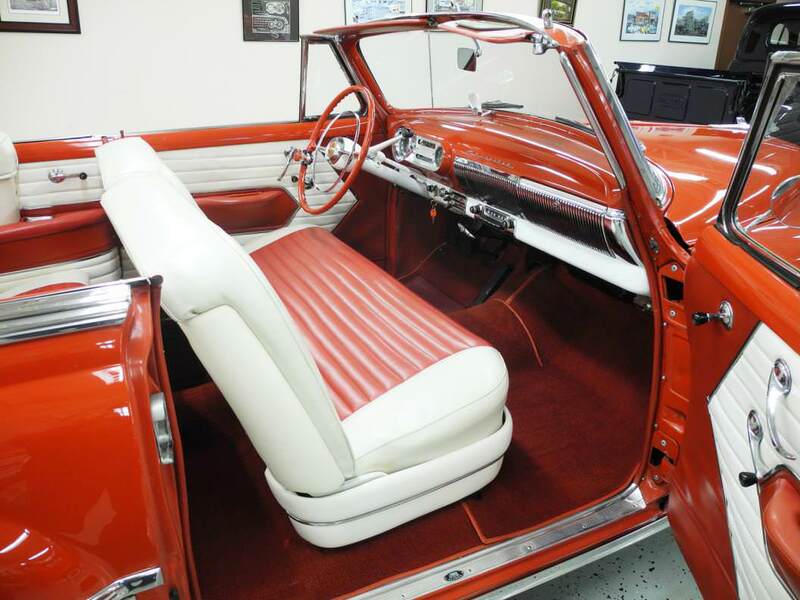 Bel Air interiors had lots of chrome along with a deluxe steering wheel with full chrome horn ring, carpeting and full wheel covers rounded out the standard equipment. For 1954 the Bel Air stayed essentially the same, except for a revised grille and taillights, this restored example finished in Romany red with Polo white quarter insert and white convertible top is highlighted by show quality chrome & stainless, complimented by red/white two-tone vinyl upholstery. 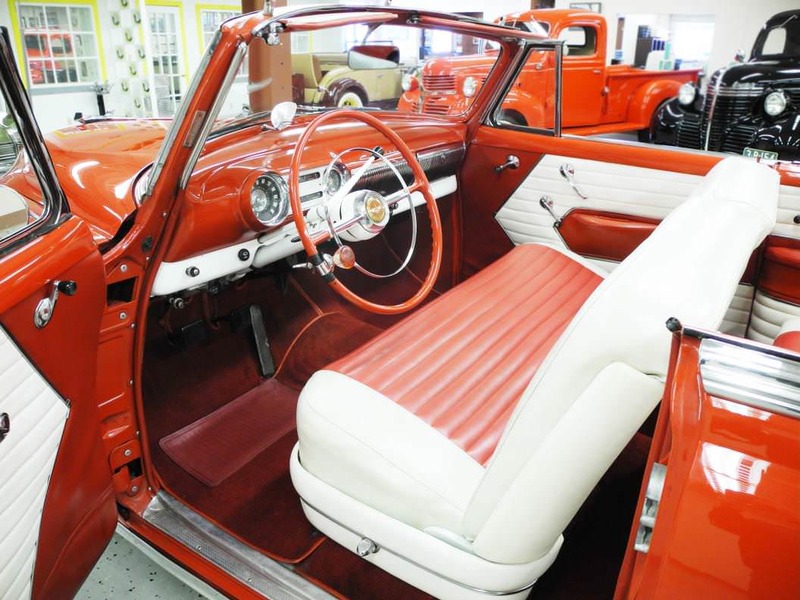 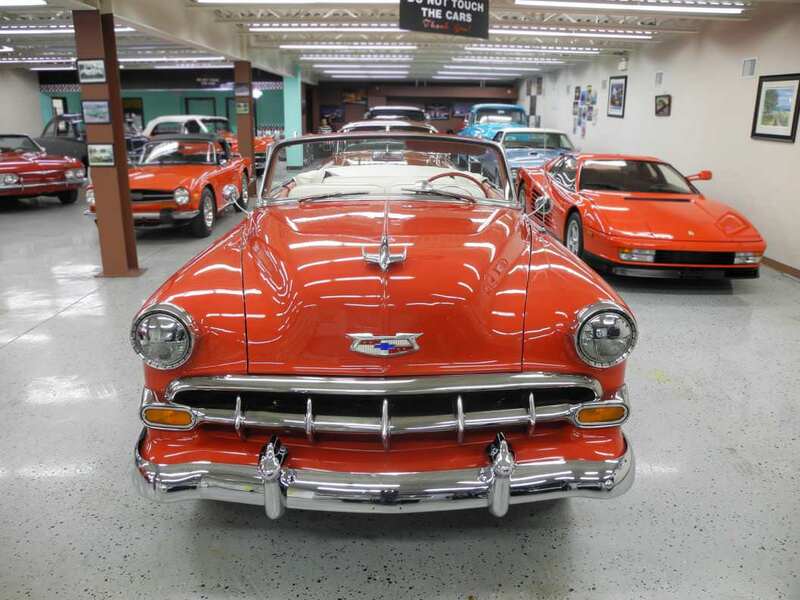 Some options include, original AM radio, clock, power convertible top, deluxe heater/defrost, updated electric wipers, bumper guards and rear fender skirts. 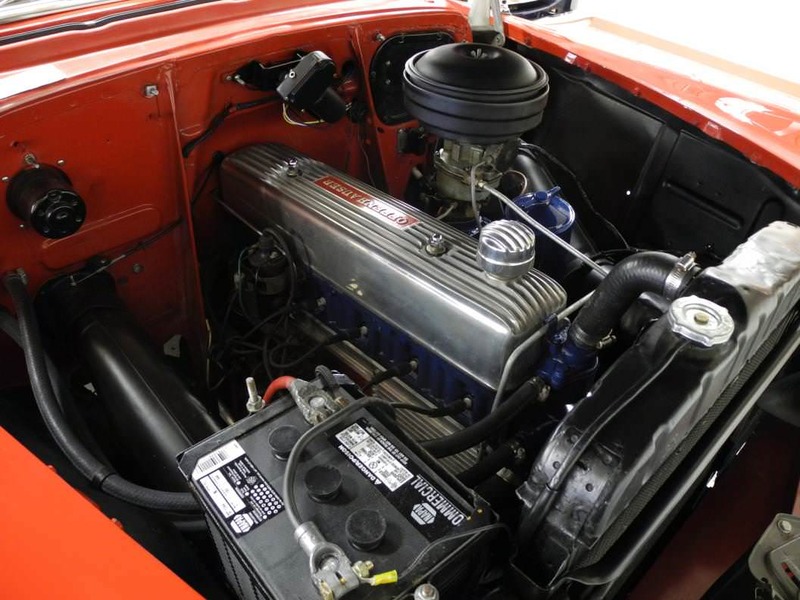 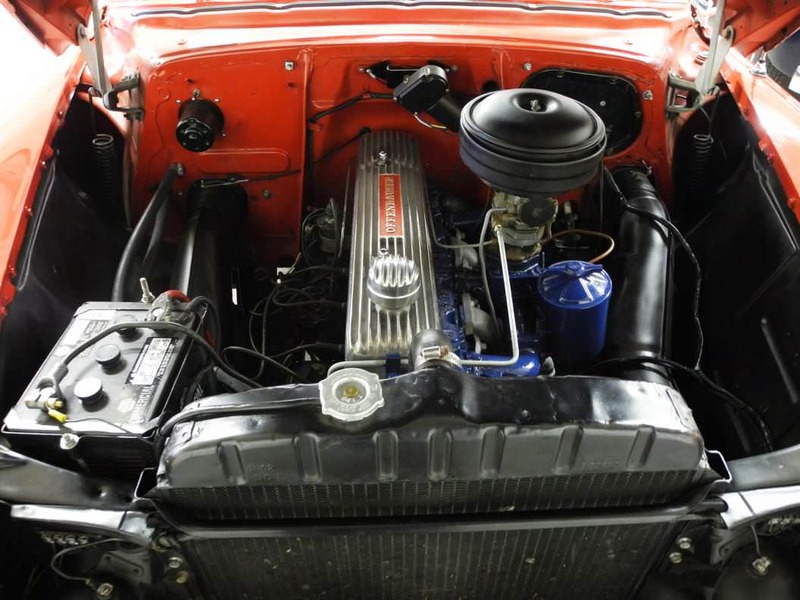 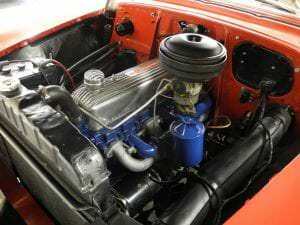 The venerable Blueflame 235cid 125hp inline six cylinder engine sports an Offenhauser aluminum rocker and lifter cover, Fenton cast two piece header with dual exhaust and three speed column shifted manual transmission. 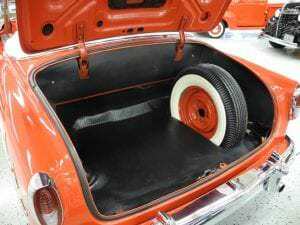 Four newer wide white wall 215/75-15 radial tires with correct full wheel covers add to the appearance of this collectable classic.